The lightweight and comfortable workout earphones.Once earphones are seated in your ears, you won't feel bulky and uncomfortable even after long time wearing. You can wear the wired earbuds around your neck when you are not using it, looks cool and fashion. These durable earphones deliver premium sound with fine-tuned acoustics that balance strong bass, clear alto and soaring treble.There is no distortion. With a very natural feel. The sound is clear and loud.It is perfect for music,movies,and phone calling. Compatible with any portable device with 3.5mm audio jack, such as: iPhone 6s/ 6s Plus /6/ 6 Plus/ 5s Se 5 5c 4s iPad air / air 2, iPad Pro, iPad mini, iPad mini 2 / 3 / 4, iPod nano 7th generation / iPod touch 5th / 6th generation Samsung Galaxy S8 S7 S6 S5 S4 S3 Android LG G5 MP3 MP4 music players, Nexus, HTC, laptops, tablets, PC and more. 30 days worry-free refund or replacement. If you have any issue with the in-ear earphones, Please contact us and our team will respond to you within 24 hours. Amazing Sound Quality -- The in-ear earphones has a perfect distortion-free stereo sound quality, bring you the perfect audio enjoyment. Suitable for all kinds of music from classical to rock. High quality audio signal transmission ensure the sound is balanced and clear. Powerful deep bass stereo makes the beats more energetic. Unique and Humanized Design -- Built-in magnets help to attach the earphones together, you can wear the magnetic wired earphones around your neck when you are not using it, looks cool and fashion, easy to carry, don't worry about it falling off and losing any more. Combined with tangle-resistant cable design, you will never worry about the cable tangled. Lightweight and Comfortable -- Lightweight sports headsets will greatly provides ideal noise isolation & comfort for long listening and talking. It is comfortable for running, jogging, fitness, exercising, walking ,dancing, and more. Waterproof anti-sweat Design, Snug and Secure Resistant To Sweat Damage. Multi-function Control -- The wired earbuds was built in a in-line controller and a high quality microphone. Can be used in hands-free mode to Answer/reject phone calls. You Can Talk In The Phone Anywhere And Anytime. Play/pause songs, skip next/previous song, volume up and down freely. Wide Compatibility -- Compatible with IOS and Android System. 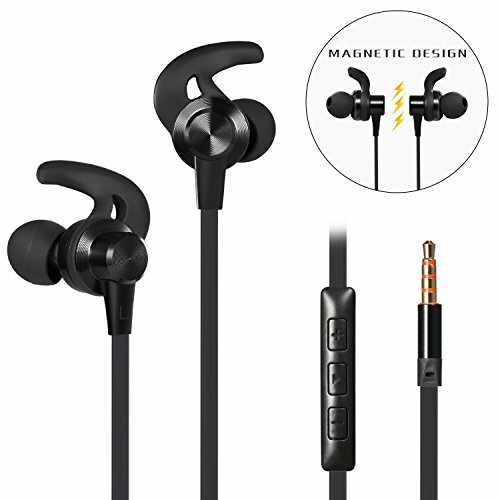 The Magnetic headphones compatible with almost all 3.5mm jack devices, such as: iPhone 6s/ 6s Plus /6/ 6 Plus/ 5s Se 5 5c 4s iPad air / air 2, iPad Pro, iPad mini, iPad mini 2 / 3 / 4, iPod nano 7th generation / iPod touch 5th / 6th generation Samsung Galaxy S8 S7 S6 S5 S4 S3 Android LG G5 MP3 MP4 music players, Nexus, HTC, laptops, tablets, PC and more. If you have any questions about this product by Anlyso, contact us by completing and submitting the form below. If you are looking for a specif part number, please include it with your message.